I used a sketch from Suzanne from her SOA Challenge to create today's card. It's a great sketch, and can see using it again - who knows - you may just see it next week on my blog! 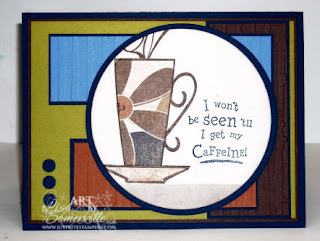 I used the Paper Piecing Technique with some great paper from The Paper Loft, and Flourishes Stamp Simply Coffee Set. Both the main panel and the Navy panel were cut with Circle Nestabilities. I used a sponge dauber and Chocolate Chip ink, to add color under the cup to resemble a table top. The sentiment is from the JustRite A Little Caffeine Set. For this card, I used the sentiment with the JustRite Harmony Rectangular Stamper, using my SAMJ for placement on my panel. 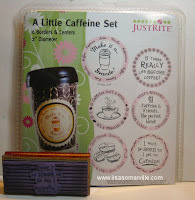 The Harmony Rectangular Stampers are a great way to get dual use out of those Centers from many of the JustRite Stamps. The three smaller panels were all embossed using the Big Shot and the CuttleBug Distressed Stripes Folder. Awesome card, I loved that sketch as well! This is really cool, Lisa!! I just love the stamps you have used!! and the papers, too! !